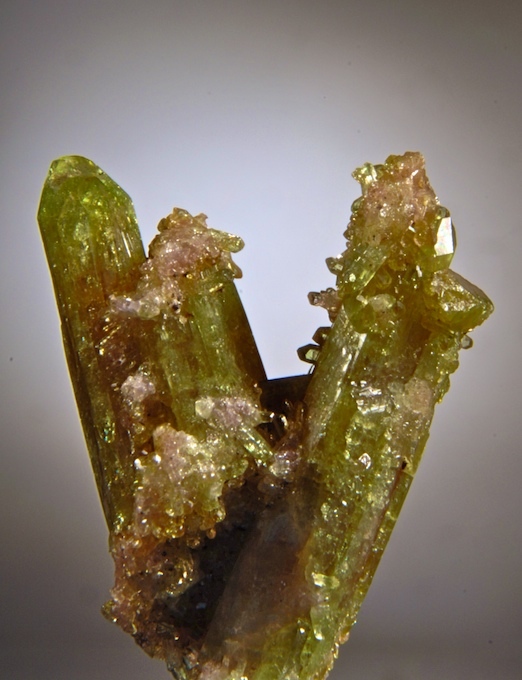 An unusual and attractive combo, bright yellowish-green crystals of Vesuvianite are scattered on a branching crystals that were previously identified as Pectolite but now seen to be at least in part Aragonite or similar Carbonate. We have just sent off a sample for anlaysis to confirm. 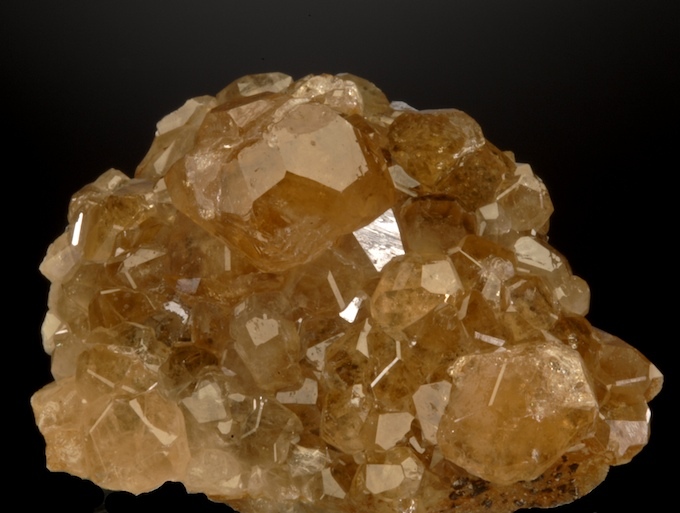 Both the Vesuvianite and the Pectolite/ Aragonite are in excellent condition- no damage can be found even with 40X magnification, which is incredible for such delicate minerals. The Vesuvianites are perched so that it is easy to see they are doubly terminated. 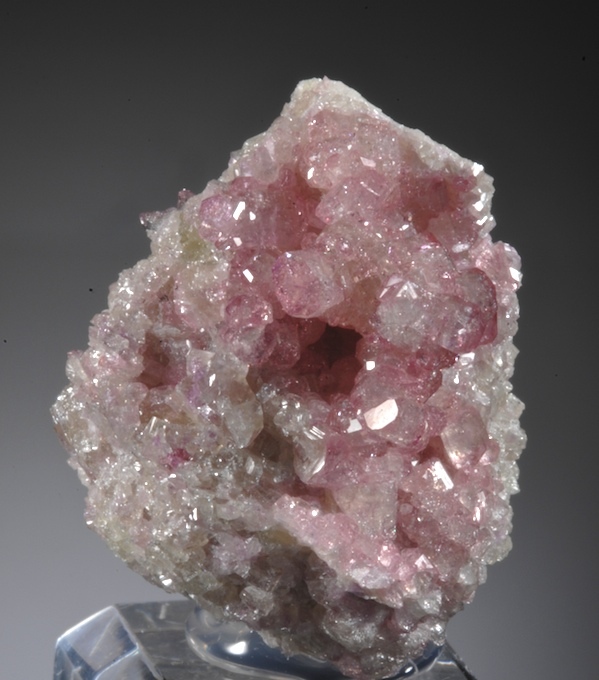 This is an intense electric pink Vesuvianite, undamaged and sparkling bright. 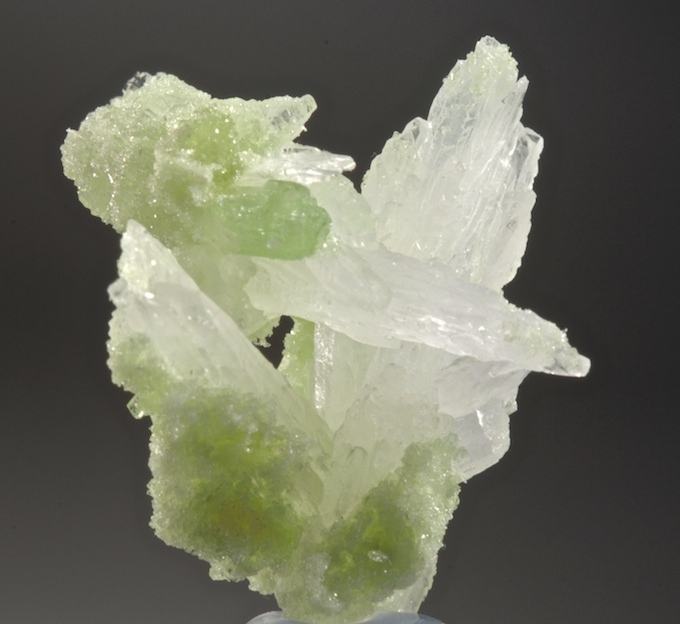 The matrix is microcrystalized Vesuvianite also but a light mint green color which makes a nice contrast. This color Vesuvianite is quite rare and this is a very esthetic piece with a lot of impact for the size. Gem clear, sharp and with great luster, this is a very strong small display piece of transparent garnet. The plate is undamaged and the whole specimen is translucent to transparent. Relatively affordable for one of this quality, this piece shows well the brilliance that made the Jeffrey Mine world famous. The color is a mid orange-red with just a hint of pink hues in some lighting. A super bright emerald green that is far more intense than can be seen on most monitors, This is the so called "chromian" Grossular. A fine competition grade and with excellent form overall, this is far better in person. One of the most prized colors for Garnets from the Jeffrey mine, this specimen has a nice contrast with the lighter green Grossular. The overall esthetics are very 3 dimensional making a very special piece. 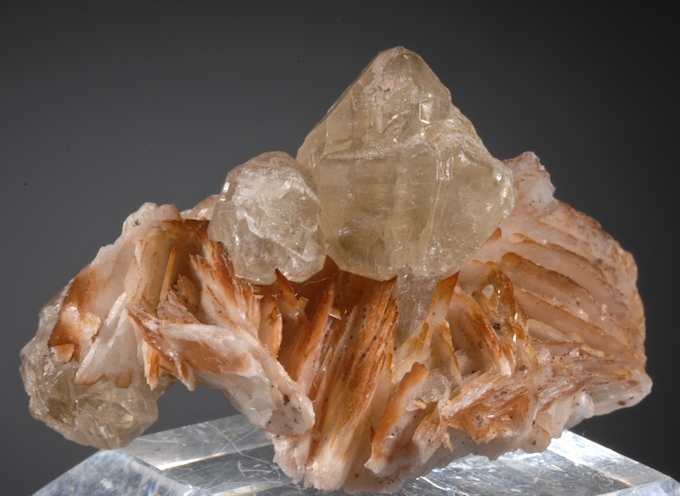 A very nice example of Cerussite on contrasting Barite from Mibladen. 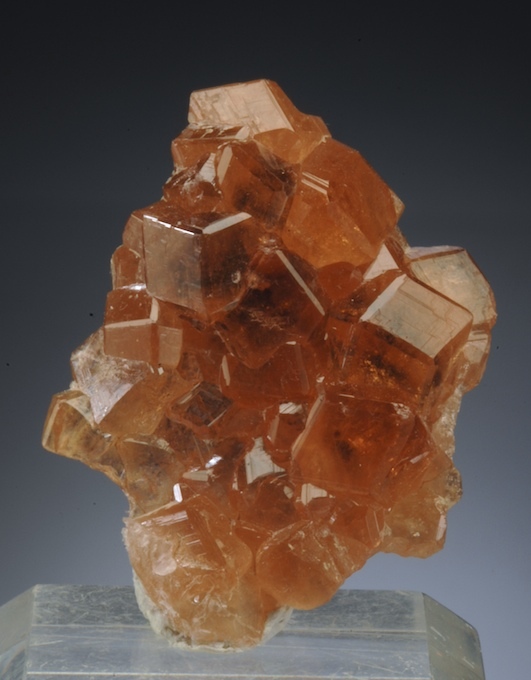 No damage, the sharp, gemmy Cerussite (double terminated) is well perched on the orange Barite. This locality has provided many good Cerussites, this one is much better than average and a very good value. 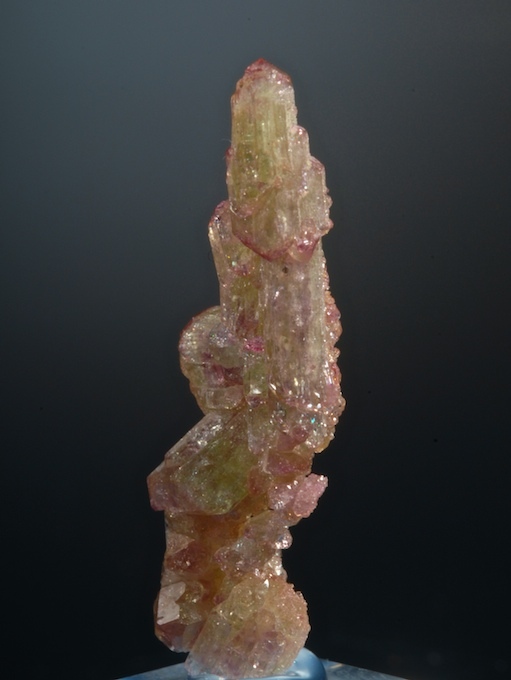 A esthetic tower of stacked bi-colored Vesuvianite crystals that is absolutely pristine and sparkling. A careful exam at 20X magnification show not the smallest chip or contact, a very rare thing indeed! The green to pink/purple hues are well presented and the overall composition a piece of sculptural art. Small but choice. The Jeffrey mine has produced more colors of Grossular than any place on earth, some are quite distinctive. This yellow to light orange honey color is unlike any other I have seen from anyplace else and is fairly rare at Jeffrey. Like the darker color crystals that are more famous, these are very transparent and usually have many internal veils that look like lots of bruising and damage. Up close it you see these are in excellent condition, just very clear. With only micro sized contacts, the crystals are very well formed. Larger than typical Grossular crystals from Jeffrey, these are up to 2.3 CM, almost an inch. Bright luster and much nicer in person. Honey color like this is a must for a fine garnet suite, and not often available in this fine quality. A fine miniature, bright and esthetic "V" of prismatic Vesuvianites are nicely decorated with smaller crystals with contrasting pink and purple hues. Excellent luster, the small crystals sparkle and the larger crystals have glassy smooth faces. 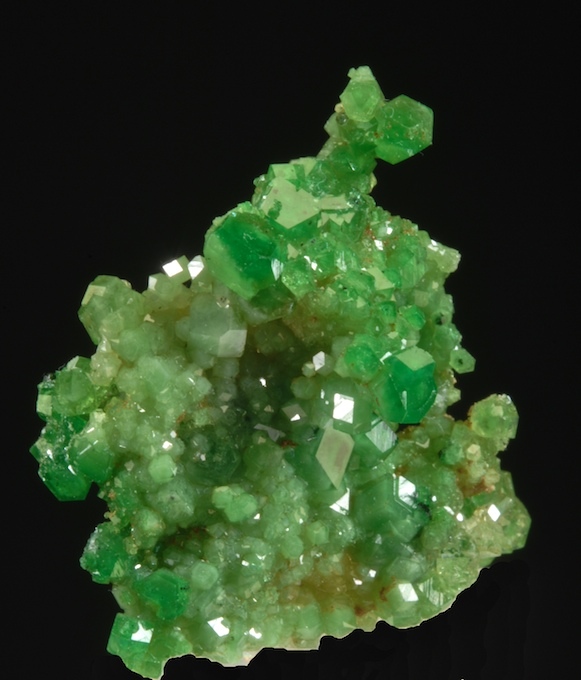 This has the eye appeal that makes this type of Vesuviianite so desirable. In very good condition with no eye visible damage, 10X magnification shows some small chips and contacts that are clearly not distracting. Specimens of this calibre when available are usually far more expensive.